Congress has failed to pass any legislation to secure U.S. voting systems in the two years since Russia interfered in the 2016 election, a troubling setback with the midterms less than six weeks away. Lawmakers have repeatedly demanded agencies step up their efforts to prevent election meddling but in the end struggled to act themselves, raising questions about whether the U.S. has done enough to protect future elections. A key GOP senator predicted to The Hill last week that a bipartisan election security bill, seen as Congress’s best chance of passing legislation on the issue, wouldn’t pass before the midterms. And on Friday, House lawmakers left town for the campaign trail, ending any chance of clearing the legislation ahead of November. Lawmakers have openly expressed frustration they were not able to act before the 2018 elections. Rep. James Langevin (D-R.I.), the co-founder of the Congressional Cybersecurity Caucus, said not passing the legislation was “a missed opportunity” to better protect U.S. elections. “Every community needs to be on guard, alert and realize that the Russians are a very well-resourced and capable bad actor that are again trying to interfere with our elections,” he said. Sen. James Lankford (R-Okla.), one of the bill’s cosponsors, told The Hill that the text of the bill is still being worked out after recent changes prompted concerns from state election officials and the White House. It had appeared the bill would make it across the finish line but last month Reuters reported that the White House had stepped in to hold up the bill. A GOP Senate aide told The Hill at the time that it was paused over a lack of Republican support and over concerns raised by outside groups. The White House did not return multiple requests for comment, and a spokesperson for Senate Rules and Administration Committee Chairman Roy Blunt (R-Mo. ), who delayed the bill’s markup, declined to comment further. Like other lawmakers and experts, Lankford pointed out that even if the bill had passed ahead of the midterms, it would still be too late to implement any of the measures ahead of November’s elections. 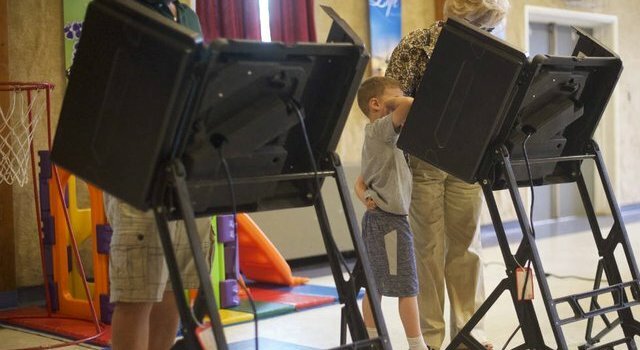 The Department of Homeland Security has offered some cybersecurity support to state election officials, and President Trump signed an executive order earlier this month authorizing sanctions against those found interfering in U.S. elections. Lawmakers also included $380 million for states to update and secure their election systems in an appropriations bill passed in March. That funding was initially authorized under the Help America Vote Act of 2002, passed in response to the 2000 presidential election, but this year’s grants were the first authorized under the law since fiscal 2010. However, when Democrats tried to pass more election security funding earlier this year, Republicans knocked down the measure, arguing that substantial funds had already been allocated. Other security bills have also been introduced after the 2016 elections, but the bipartisan bill spearheaded by Lankford and Sen. Amy Klobuchar(D-Minn.) was touted as the best shot to legislation on the books shielding U.S. election systems from cyber attacks. Even so, it remained the subject of extensive debate: The original bill included a pilot program for states to conduct audits on limiting risks, which would examine a number of ballots to ensure that systems weren’t compromised. But that program became mandatory in a later version of the bill, costing it support from state officials and advocacy groups who argued the measure would be too great of a burden. Voting groups have also voiced disappointment at the lack of action, but were quick to praise Klobuchar and Lankford’s bipartisan push to pass legislation. Vermont Secretary of State Jim Condos (D), the president of the National Association of Secretaries of State (NASS), told The Hill that while many states are already implementing the measures that would be included in the bill, it was disappointing to not have them on the books. NASS has not taken a public stance on the legislation. He said that the bill would “send a strong message” to bad cyber actors like Russia, which interfered in the 2016 election, as well as to Americans that their election systems are secure. “I think this would go a long way to helping us let the public know that our systems are strong and, on top of that, that everyone takes [the issue] seriously,” Condos said. It is unclear if Congress will be any closer to overcoming the hurdles to legislation after the midterms. But advocates insist they will keep pushing for a solution. “This is a time for unity where the country has to unite to fight off foreign meddling in our election because that undermines our democracy,” said Marian Schneider, the president of Verified Voting. But she also noted that the Lankford-Klobuchar bill was originally introduced in December 2017 and that lawmakers had months to finalize the text. “I think there’s an unfortunate thing going on here that whenever elections is the topic or is the subject area that it becomes politicized,” she said. PROVIDENCE, R.I. (WJAR) — Hundreds of Democratic supporters skipped a beautiful Sunday afternoon to make their way to the Rhode Island Convention Center for party politics. Squeezed into a small room on the top floor was a who’s who of Democratic lawmakers, warming up the crowd for the headliner, former Vice President Joe Biden. “I’m from that other small state. The second smallest state. You guys have a bigger population than we do,” joked Biden about his home state of Delaware. “We love Joe Biden. Hopefully, Joe will run for president in 2020,” said Norbet Oliveira, a union representative. “Go for it,” said Debbie Marandola of Warwick. 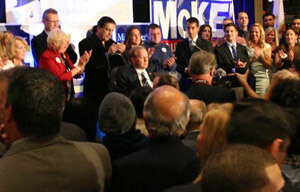 This time, he reaffirmed his commitment to Rhode Island leaders. “The thing that your delegation has, more than almost any, is people with great character, with backbone,” said Biden. Gov. Gina Raimondo spoke for about 10 minutes, as did the state’s entire congressional delegation. Reps. Jim Langevin and David Cicilline and Sens. Jack Reed and Sheldon Whitehouse, coming off a busy week in Washington with the Judge Brett Kavanaugh hearings, also rallied their troops. Biden didn’t mention 2020, but said he believed Dr. Christine Blasey Ford was credible and deserved an FBI investigation after her accusations against Kavanaugh. The former vice president also verbally attacked President Donald Trump and assaults on the free press, the Justice Department and other institutions. He urged Democrats to turn out at the polls for the midterm elections. “Folks, this election is bigger than politics. That’s not hyperbole. It’s bigger than politics. The core values that built this nation are at risk,” said Biden. WASHINGTON, D.C .– On Tuesday, U.S. Senators Jack Reed and Sheldon Whitehouse, Congressmen Jim Langevin and David Cicilline, and Governor Gina Raimondo announced $12.6 million in federal funding for Rhode Island’s battle against the opioid epidemic. Rhode Island’s share from a grant program at the Substance Abuse and Mental Health Services Administration (SAMHSA) rose from $2.1 million last year to $12.6 million as a result of the Consolidated Appropriations Act of 2018, also known as the Omnibus Appropriations law. All four members of the delegation voted for the Omnibus, which included a $3.3 billion boost this year for opioid funding, with $142 million set aside specifically for states with the highest mortality rates from overdoses. According to the Rhode Island Department of Health, there were 323 accidental drug overdose deaths in Rhode Island last year, down from 336 in 2016–a year in which, as per U.S. Centers for Disease Control and Prevention, Rhode Island had the ninth highest drug overdose death rate of any state in the nation. “This public health crisis requires a comprehensive approach, and I remain dedicated to supporting these critical efforts at the federal level,” he added. The funding is part of a $930 million round of grants nationwide that was first authorized by Congress in 2016 in the 21st Century Cures Act, which allocated $1 billion in funding for states to prevent and treat addiction. The grant will go to Rhode Island’s Department of Behavioral Healthcare, Developmental Disabilities and Hospitals (BHDDH) to help prevention efforts, expand treatment capacity for medication assisted treatment as well as residential treatment for individuals and families, launch mobile treatment and induction services to reach under-served areas, increase availability of recovery support services and recovery housing, create a statewide pre-arrest diversion program and purchase lifesaving Naloxone. It was smooth sailing under sunny skies for Congressman James Langevin, who took the Block Island Ferry over to the island to visit with his constituents on Sept. 20. Langevin toured the island, as is customary each year, visiting the Block Island School, the Block Island Power Company, North Light Fibers, the Medical Center, and The National Hotel, where he participated in a meet and greet luncheon hosted by the Democratic Town Committee. Langevin, a Democrat, said the Republicans in Congress are ineffective in standing up to the administration, and are a detriment to social, economic and environmental programs. “Look at the tax reform bill that was passed by this administration; it’s written to benefit corporations and the wealthiest one percent,” he said. During a discussion with the Student Council, teacher Jayne Conway asked Langevin if a “blue wave” happens during the upcoming election, will “impeachment be on the table?” A blue wave would mean that the Democratic Party was elected to a majority in both houses of Congress in November. “There is a possibility of a blue wave,” but it is “too early to think about impeachment” of the President, he said. “We need Robert Mueller to finish his (Special Counsel) investigation, and then we’ll go from there.” Mueller, who is Special Counsel for the Department of Justice, is leading a law enforcement and counterintelligence investigation into Russian interference in the 2016 presidential election. Student Mac Brown asked the congressman what his hardest decision has been during his tenure in Congress. Langevin said voting on the Iraq War, which he opposed, was a really “tough” decision. “I had to weigh all of the information, and whether or not there were weapons of mass destruction,” he said. 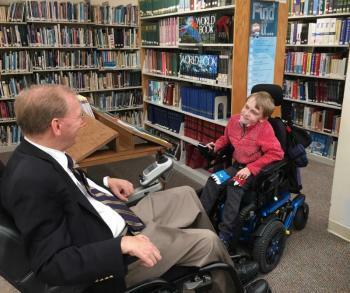 After meeting with the Student Council, Langevin spent time chatting with fellow wheelchair user Mason Miro, who has been recognized by the Muscular Dystrophy Association as a special Ambassador. The two chatted about their wheelchair designs, school, and Block Island. Mason, who is a fourth grade student, told Langevin that his favorite class was gym. “We all are,” said school Principal Kristine Monje. Town Council members who attended Langevin’s lunch at The National echoed his sentiments about voting and lauded his appearance on the island. First Warden Ken Lacoste was not in attendance. At one point, Langevin was pulled away from the luncheon to speak on his cellphone with Cristopher Krebs, who is Under Secretary for the Department of Homeland Security. “It shows that he cares. It’s a good representation of listening to people, and experiencing different things,” remarked Councilor Sven Risom. House Minority Leader Nancy Pelosi (D-CA) appointed Rep. James Langevin (D-RI) to the newly created Cyberspace Solarium Commission on Tuesday, while the House passed four cyber-related bills including one to create a vulnerability disclosure program at the Department of Homeland Security. Pelosi named Langevin and former Rep. Patrick Murphy (D-PA) to the commission, created under the 2019 National Defense Authorization Act. The House minority leader is required to appoint two members of the Commission, one of whom must not be a current member of the House. The Speaker of the House is designated to appoint three members, with the Senate majority leader to designate three, and the Senate minority leader to pick two members. Other members of the commission automatically include the FBI director, the deputy secretaries of the departments of Defense and Homeland Security, and the principal deputy director of National Intelligence. On Tuesday, the House approved four cybersecurity bills, including H.R. 6735, the Public-Private Cybersecurity Cooperation Act. The bill sponsored by House Majority Leader Kevin McCarthy (R-CA) directs the DHS secretary to establish a “vulnerability disclosure policy” for DHS internet sites within 90 days of the legislation being signed into law. The House Homeland Security Committee approved the bill earlier this month, and Chairman Michael McCaul (R-TX) spoke on the floor in favor of passage, saying it would give a “legal avenue” to allow researchers from the private sector to identify cyber flaws in DHS’ systems. McCaul also spoke in favor of another bill passed Tuesday, H.R. 6620, the Protecting Critical Infrastructure Against Drones and Emerging Threats Act, sponsored by Homeland Security cyber subcommittee ranking member Cedric Richmond (D-LA). This bill would require DHS to prepare a threat assessment related to unmanned aircraft systems, and was previously approved by the House Homeland Security Committee. The House passed two more bills: H.R. 5433, the Hack Your State Department Act, sponsored by Rep. Ted Lieu (D-CA), to establish a “bug bounty” program at the State Department; and H.R. 6229, the National Institute of Standards and Technology Reauthorization Act, sponsored by Rep. Barbara Comstock (R-VA), which supports cyber programs at NIST. House Democratic Leader Nancy Pelosi, D-Calif., has appointed Rep. Jim Langevin, D-R.I., and former Rep. Patrick Murphy, D-Pa., to the recently created Cyberspace Solarium Commission, a 14-member public-private panel charged with developing consensus and actionable strategy to protect and defend the U.S. in cyberspace. Legislation creating the commission was approved as part of the FY 2019 National Defense Authorization Act (NDAA). Rep. Langevin is a co-chair of the Congressional Cybersecurity Caucus and ranking member of the House Armed Services Committee’s Emerging Threats and Capabilities Subcommittee. Murphy was a congressman from 2007 to 2011, and is a former under Secretary of the Army. 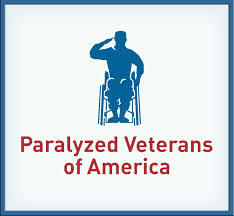 WASHINGTON, D.C. —Paralyzed Veterans of America (PVA) today lauded House and Senate transportation committee leaders for coming to an agreement on a long-term Federal Aviation Administration (FAA) bill. “We are extremely pleased that the FAA Reauthorization Act of 2018 (H.R. 302) includes multiple provisions that specifically target the air travel experience of passengers with disabilities,” said PVA National President David Zurfluh. The FAA Reauthorization Act of 2018 includes some crucial provisions such as an Airline Passengers with Disabilities Bill of Rights; an Advisory Committee on the Air Travel Needs of Passengers with Disabilities; a study on in-cabin wheelchair restraint systems; increased civil penalties for damage to a passenger with a disability or his or her mobility aid; and a requirement for the Department of Transportation (DOT) to move forward in implementing the reporting requirement for large domestic airlines to report on the number of wheelchairs and scooters enplaned and subsequently damaged. H.R. 302 also includes a revision of training requirements for Transportation Security Agency (TSA) officers in screening people with disabilities in consultation with disability and veterans organizations and increased reporting requirements. “We greatly appreciate the efforts of the leaders of the Senate Commerce, Science, and Transportation and House Transportation and Infrastructure and Committees who listened to the concerns of paralyzed veterans and all people with disabilities to ensure that this FAA Reauthorization Bill begins to address the difficulties people with disabilities encounter in air travel and in transiting airport security,” stated Zurfluh. Zurfluh also thanked Chairman John Thune (R-SD), Ranking Member Bill Nelson (D-FL), Chairman Bill Shuster (R-PA), and Ranking Member Peter DeFazio (D-OR) for their efforts on this bill. WASHINGTON, D.C — President Trump has authorized new, classified orders for the Pentagon’s cyberwarriors to conduct offensive attacks against adversaries more freely and frequently, the White House said on Thursday, wiping away Obama-era restrictions that his advisers viewed as too slow and cumbersome. “Our hands are not as tied as they were in the Obama administration,” John R. Bolton, the national security adviser, told reporters in announcing a new cyberstrategy. Mr. Bolton rewrote a draft of the strategy after joining the administration in April. Many of his remarks on Thursday focused on a secret order — which Mr. Trump signed in August but which has never been publicly described — that appears to give far more latitude for the newly elevated United States Cyber Command to act with minimal consultation from a number of other government agencies. The order essentially delegates more power to Gen. Paul M. Nakasone, who took over this year as the director of the National Security Agency and the commander of United States Cyber Command. During his Senate confirmation hearing in March, General Nakasone complained that America’s online adversaries attacked with little concern about retaliation. But this month, General Nakasone said he was more comfortable with the new guidance issued by the White House, even though the administration has not made any of it public. Senior officials have said it eliminates a lengthy process of consensus-building across the government — the Departments of Commerce, Treasury and Homeland Security among them — before the United States conducts an offensive action. It is not clear whether Mr. Trump must still approve every major offensive online operation, as Presidents George W. Bush and Barack Obama did. Mr. Bolton did not shed much light. “Our presidential directive effectively reversed those restraints, effectively enabling offensive cyberoperations through the relevant departments,” he said. He said that since Mr. Trump took office, the administration has “authorized cyberoperations” against rivals, though he gave no details. Much of the strategy that was made public on Thursday strongly echoes similar documents issued by Mr. Obama and Mr. Bush. They focus on improving digital defenses for the United States government, bettering training, working with private industry to share information about vulnerabilities and working with allies. While the words in the strategy differ from the past, the impetus is the same. It did, however, identify specific countries as adversaries. But the classified directive appears to be significantly different, as Mr. Bolton said on Thursday. His indictment of the previous administration omitted the fact that Mr. Obama continued or initiated three of the most aggressive cyberoperations in American history: one to disable Iran’s nuclear fuel production, another to attack North Korea’s missile programs and a third against online recruitment and communications by the Islamic State. The first, code-named Olympic Games, was judged successful at destroying about 1,000 nuclear centrifuges for a year. The Korea operation had only mixed results at best, and Mr. Obama’s own defense secretary later wrote that the operation against the Islamic State proved largely ineffective. But Mr. Obama hesitated to strike back at Russia in 2016 after revelations of its breach into the Democratic National Committee, and acted only after the presidential election. Mr. Bolton became the first American official to formally acknowledge what was widely known: that the Chinese government was behind that intrusion. Additionally, the Trump administration accused North Korea of mounting the WannaCry attack that brought down the British health care system, and Russia of initiating the NotPetya attack that was aimed at Ukraine and cost hundreds of millions of dollars in damage, including to shipping companies like Maersk. But Mr. Bolton, whose concepts of deterrence were formed in the Cold War, is likely to discover what his predecessors learned: Almost every strategy that worked in deterring nuclear attacks does not fit the digital era, and even figuring out where an attack originated can be a challenge. The government has grown more skilled at attributing the source of a cyberattack, but the process remains lengthy. By the time a conclusion is reached, it is often too late to mount a successful counterstrike. Mr. Trump has particularly muddied the waters in assigning blame for attacks, repeatedly expressing doubts that Russia was behind the hacking of the Democratic National Committee and members of Hillary Clinton’s 2016 presidential campaign. The Justice Department has indicted officers of Russia’s military intelligence unit, once known as the G.R.U., and the Internet Research Agency, in those attacks. Some of those efforts have already begun: The American accusations against North Korea and Russia last year were immediately echoed by Britain and other Western powers. BRISTOL, R.I. — A Bristol native who died serving in Afghanistan was honored Sunday for his patriotism on one of the country’s most patriotic streets. More than 200 people along with Gov. Gina Raimondo and the entire congressional delegation turned out to dedicate the Bristol Post Office on Hope Street in memory of 1st Sgt. P. Andrew McKenna Jr. When terrorists breached his defensive perimeter with a truck bomb in Kabul on Aug. 7, 2015, McKenna ran toward attackers, helping to repulse them while losing his own life. He was posthumously awarded the Silver Star, the third-highest military honor, and the Purple Heart. A Green Beret assigned to the 7th Special Forces Group, he was deployed overseas six times, and received the Bronze Star during his first tour in Afghanistan. McKenna always wanted to be a soldier. As a child, he rarely took off his “Army” uniform, and friends remembered how he organized the neighborhood kids into one band of brothers or another. McKenna traveled far from home during his nearly 20 years of service, but he never forgot what made Bristol special. Three years ago, he was honored at the Bristol Fourth of July parade for traveling the farthest — from Afghanistan — to his hometown. The town bestowed an American flag that had once flown above the White House. A month later, he was gone. His mother, Carol McKenna, was a bit overwhelmed by this latest tribute, which was hardly the first. A stretch of Route 114 between the Warren Bridge and the Mount Hope Bridge has been renamed in his honor. A monument sits in front of the Bristol VFW Club. Even those who didn’t know McKenna personally had some connection to his family. The mother whose son, an Eagle Scout, helped build the monument on Hope Street. The neighbor who has a photograph of him as a little boy, dressed in his uniform. Sgt. Maj. Calvin Boersma served with McKenna in Afghanistan. He said Andrew saved his life. Boersma described the boyish side of McKenna, the young soldier who liked to tear up North Carolina on his motorcycle, the guy who gave friends a thumbs-up if he liked their girlfriends. But he also recalled a man who was fiercely loyal, no matter how far away his buddies were. When one soldier was in a bad way, McKenna showed at his house and forced him to get out of bed and go outside. The friend later described that encounter as a turning point.